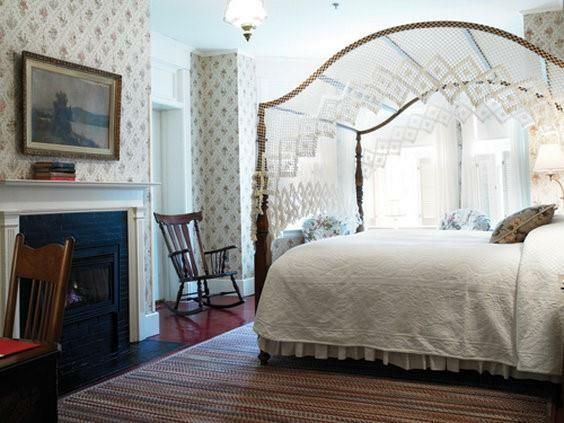 Since circa 1773 The Red Lion Inn has been welcoming travelers with its superior style service and hospitality. Featuring state-of-the-industry amenities amid fine antiques and art accommodations are located in the Main Inn and charming adjacent Guest Houses. Each of the 125 individually decorated guestrooms combine old-fashioned comfort with the latest amenities from luxurious Italian linens and fluffy white robes to wireless Internet access throughout the property. Some newly renovated rooms offer gas-lit fireplaces. Guests enjoy outstanding cuisine by a James Beard House-honored chef who uses local ingredients an award-winning wine list and four distinct dining experiences the elegant Main Dining Room the cozy Widow Binghams Tavern the casual Lions Den pub or in warmer months the flower-filled Courtyard. The Lions Den pub also offers draught beers local microbrews and live entertainment seven nights a week and never a cover charge. Massage therapist on staff boutique shopping a private golf course spa numerous cultural historic attractions and outdoor recreational opportunities are nearby. Recommended by National Geographic Traveler NY Times and Boston Globe. The scenic Berkshires of western Massachusetts have a well-deserved reputation as a bucolic region rich with both arts attractions and outdoor recreation. Within minutes of the dozens of year-round and seasonal attractions offer a remarkable choice of museums music dance theatre and family-friendly activities. Stockbridge itself is the home of Tanglewood the summer home of the Boston Symphony Orchestra the Berkshire Theatre Festival the Norman Rockwell Museum Chesterwood and more. Berkshire Botanical GardenOne of the earliest non-profit nursery gardens in the United States this 15 acre garden offers beauty relaxation and a first-hand look at the variety of plants and trees that grow in the Berkshires. Berkshire Theatre FestivalEstablished in 1928 its one of the oldest summer theatre festivals in the country showcasing performances in the historic playhouse new Unicorn Theatre and Theatre Under the Tent for Families. Hancock Shaker VillageTwo-hundred-year-old Shaker village. 21 historic buildings Shaker furniture crafts heritage farm and garden hands-on fun. MASS MoCAOpen to the public since May 1999 MASS MoCA is an extraordinary project to convert a 27-building historic mill complex in the Berkshire mountains of Western Massachusetts into a multi-disciplinary center for visual performing and media arts. Mahaiwe Performing Arts Center- Inc.
Marian FathersA religious community of the Catholic Church it includes The Shrine of The Divine Mercy and Immaculate Conception Novitiate. Mission HouseProperty of the Trustees of Reservations the oldest house in Stockbridge was built in 1739 by the Reverend John Sergeant missionary to the Stockbridge Indians. Prime OutletsOutlet shopping with savings on brand-name stores including Polo Ralph Lauren Coach Banana Republic GAP J. Crew Hugo Boss Ann Taylor Brooks Brothers BCBG Max Azria and more. TanglewoodClassical popular and jazz concerts June to Labor Day at the summer home of the Boston Symphony Orchestra and the Tanglewood Music Center. The Berkshire MuseumThe only art history and science museum for families in the Berkshires. The MountElegant 1902 mansion and gardens designed by and for novelist Edith Wharton The Age of Innocence Ethan Frome. The Norman Rockwell MuseumExplore the worlds largest and most significant collection of original art by Americas favorite illustrator Norman Rockwell and discover changing exhibitions of other contemporary and past masters.